These 432 pages of documents were recovered on ██/██/████ from the residence of Agent Waters (KIA) in ██████, South Africa, three months after his disappearance. It is unknown whether the partial translation of the documents was done by Agent Waters or his partner, Agent Laker (MIA), or by an unknown third entity. The handwritten notes on the documents match the handwriting of Agent Waters, and the questioning of the other residents in the building leads to believe that Agent Waters was the only occupant of the residence for at least two months. Indeed the only evidence towards Agent Laker ever arriving in South Africa are short references to him in the handwritten notes in these documents. Examination of Crash Site B1 has found only destroyed remains of the craft, and the irradiated metal object classified as SCP-███. 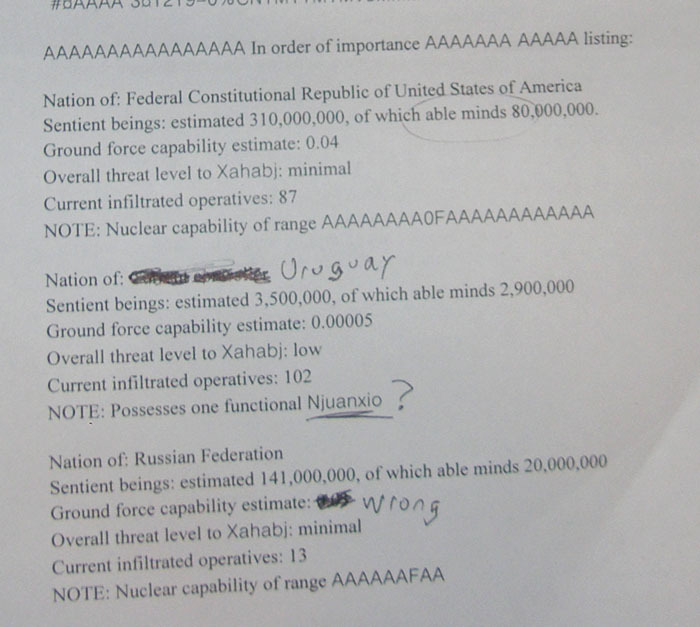 An entry in the personal voice diary of Agent Waters (see file [DATA EXPUNGED] ) confirms the theory that the documents were somehow extracted from SCP-███, which makes further research into it crucial. It should be noted that Agent Waters claims the date to be 25th September at the time of the entry, but the actual voice file was created two weeks after said date. Evidence collected by Agents ██████ and ████ suggests that Agent Waters located and secured the Crash Site as per his original orders, but after his final report to Foundation staff on ██/██, destroyed the craft and isolated himself into his residence in ██████ to translate the extracted data. 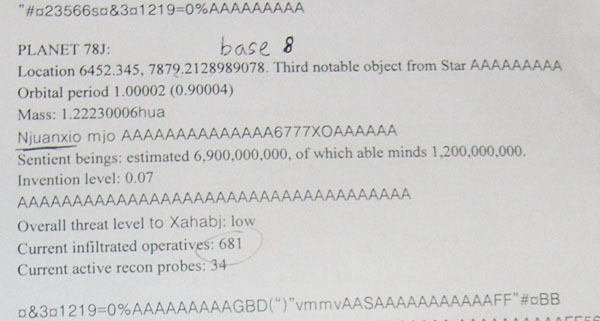 Because of the large amounts of data in these documents, only the most coherent and notable parts are collected here. I am going to personally supervise the investigation into the information leaks apparent in these documents. All that information about the Foundation should have never been accessible to a single person. Class-A amnestics will be administered to all agents and other personnel who have had access to the original documents.